Lookin' for great Podcasts? Look no further. Visit Super Fantastic Ultra for a ton of great Halloween Podcasts plus a whole lot more. Hoagie Malone is your host...what more do you need? Get goin'! From time to time I am going to make available a FREE download of one of my tracks. Here is a FREE MP3 download of Trick Or Treatin' taken from my band Rain Station's CD DARK RIDE. 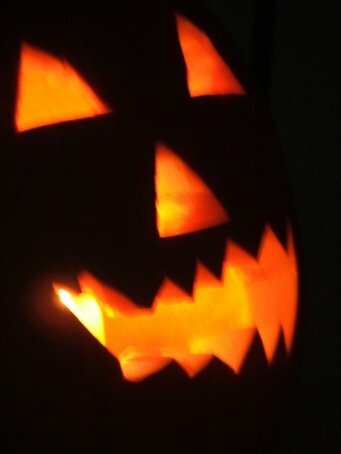 My daughter and I carved our first Jack O'Lantern of the year the other night (see to your left). We had a great time- listening to Halloween music, designing the face and making our new friend come to life. Once the candle was in I took a ton of pictures and we both enjoyed the smell of the pumpkin with a candle burning inside. There's just something about that smell that brings back so many excellent memories. Right now the Jack O'Lantern is on our mantle, but soon it'll be out and on the front porch along with the others I intend on carving before Halloween. Carve a Jack O'Lantern TONIGHT. Time is running out...Halloween is almost here!